We have a big space above our entertainment center. And a fairly tall ceiling. So I came up with a solution to fill up all of that plain ‘ol wall. Do you remember when I made some wall hangings a while ago? Well I wanted some big ones for our front room. But a custom size, different than the art canvases available…..and a bit cheaper. And I added a bit more texture this time around…..
Ah, just right for our space. So I bought a piece of underlayment from Home Depot. I have no idea what it’s intended for but it was $5 for a 4 x4 foot piece………..just perfect for my budget. (all of you carpenter minded folks……just keep the laughter minimal.) It’s super thin and some sort of pressed wood. I cut three pieces that were 15 x 30 inches. And once I saw those markdown signs of $0.50, $1.00, and $2.00, I dove right in. That’s where I found some scrap wood to make the frame for the wall hangings. So I cut my pieces of wood to fit within the size of the large piece of underlayment. The 2 long pieces were 30 inches long and the 2 end pieces were 11 inches long. And then stapled the underlayment piece right to the wood frame. Then I cut a piece of material slightly bigger than my form, making sure to have enough excess fabric to fold around the back. Pull fairly tight and staple in place…..
And fold the corners over nice and snug…..
For the center gold wall hanging………I made folds in my piece of fabric and pinned and ironed as I folded. They weren’t huge folds, just enough to tuck the fabric underneath. The fabric I used was sort of satin-y so the folds didn’t stay ironed perfectly well. (If using a lightweight cotton, you shouldn’t have the problem I did.) So I sewed the folds in place at the sides and kept the center pinned……. And then staple the fabric (with the pins still going down the center) to the wooden form, making sure to pull the edges tight, securing the folds in place. (Start on one of the sides and staple along the entire side. Then pull as you are stapling the other side. Then staple the shorter ends………but don’t pull to hard on the ends, or you will pull on the folds a bit.) Then take the pins out. Pound in some nails and hang up your new focal point to the room. I really love this!! Great job! Wow, love these, so cute! I love the fabrics that you used as well. perfectly clever. Another wonderful job! Thanks so much for sharing! Great idea, I love it. I'm renting too and I really, really crave paint. Fabric works! What a great idea. I like it a lot. I am always intimidated by projects that involve a saw. I figure I'll probably cut my fingers off. I LOVE this. Great job! Thanks for sharing. I think you and I need to be BFF;) Amazing and this is EXACTLY what I need in my kitchen…. something amazing and super easy! So cute! I am definitely going to try this… we have a big wall with nothing on it and I can't come up with anything to put there, until now! Thanks so much for sharing… I am a new follower and have really enjoyed your site! That looks absolutely amazing! You go! LOVE this project!! It is so fun and super easy!! I went to Lowe's about a week ago to get some wood for a project and wanted them to cut it for me. Behind the saw was a whole pile of wood! I asked the guy what they do with that wood and he said they just throw it out!! WHAT, are you crazy!! People pay good money for wood! I asked if I could have it!! I came home with a whole bunch of FREE WOOD! This is such a great idea!! I have saved this in my Google Reader for when I need to decorate my basement!! My mom made some similar wall art for my sister's house. First, she covered some pillows for their couch. Then she pieced together the scraps for a coordinating art piece. What a great idea! I love all the technical terms…sounds just like the words I would have used!! I am going to have to try this out in my kids rooms. Your idea with the staple gun just helped me save a picture frame my 18 month old just pulled off our wall yesterday. Brilliant, as always! I have a space above our TV that I have been finding ideas to try. I need inexpensive and I need beautiful. I will show this to my husband since I am a bit clumsy with power tools to cut the wood and stuff. Thank you so much for this idea. I cannot wait to go fabric hunting…My mother is going with me next Tuesday I hope. Oh, I love this! Love, love, love it. I can't wait to try this out! The fabric choices are phenomenal. OK. Taking a deep breath and reminding myself that I have other things to finish first………but this one's going on the list! Best thing I got from this post is that there is a sale rack at Home Depot!! I knew about paint but not wood! Thanks for posting that! This is amazing! I never would have thought of it. the fabrics look great together, I love the textures, and who knew there was a sale section at the hardware store??? I'm so there. This is just what I was looking for. What a brilliant idea. We're constantly on the move and unable to add color to our surroundings. 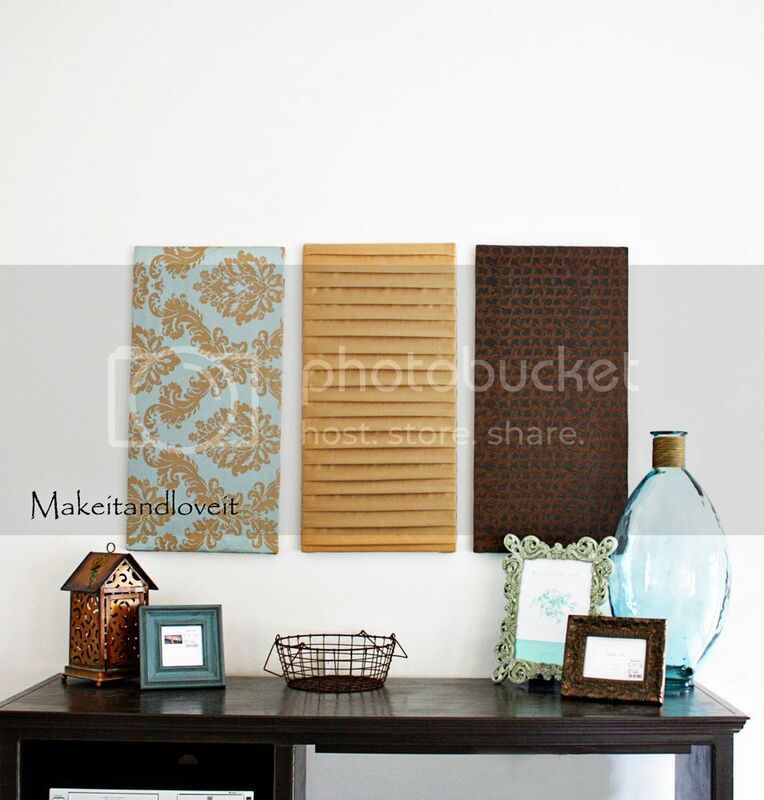 I love that you've added texture to the wall hangings and what better color combo than chocolate brown and blue? Very cool idea. You are so wonderfully creative. Keep up the great work and sharing your ideas. You newest follower for the moment (I'm use tons more to come). Take care and have a super day. God Bless!!! Those are so awesome, I wish I had the wall space to make some. Maybe the bathroom, I have to find someplace to make these for. Ashley, I LOVE it!! What an AWESOME idea!! We have a huge space on our wall like that. I may just have to look into doing this! Thanks!! Genius! I love it!! I'm totally bookmarking this idea for the next place I need to make lovely on the cheap! just recently discovered your blog. i'm really enjoying looking around and getting inspired! What a cute idea. I think I will try this and it would go even as a holiday decoration item!!! So creative. BEAUTIFUL!!! You are very creative! I looked at a lot of projects on your blog and they are great! I strat reading your blog today and i love it….thank you so much for sharing everythink you do. I love your idea with the folded fabric. How creative! You have just helped me solve the dilemma of our two empty walls that flank a big window in our Living room!! ThankyouThankyouThankyou!!! This is JUST what I have been looking for for our living room. Thank you! awesome idea! makes me want to go the craft store now! I love this…I wish I could talk hubby into allowing me to put a hole in the wall…this would be perfect. This is amazing! Beautiful colors. Oh the life of a renter, is right! Not only can we also not paint, 3 out of 4 of our walls are cinder block so we can't hang anything either. Not too fun! But your pieces look amazing. And even if you could paint, the fabric adds some elegance. I've seen this done with artist canvases before but these frames look SO easy to make! And so much CHEAPER! I just bought a staple gun… I guess I have no excuse not to try this now! I love this idea :) I think looks really fancy. Thanks for sharing!! It has been said many times already… I love this!!! I have just found the solution to my empty wall and yes I rent too. This is s cute idea. You could also hang pictures on them too; it would make for a cute arrangement. I love these! I've been wanting to do a black and white vintage floral print for curtains in our living room but knew the room was way too small for something that bold. I'll just have to make something like this instead that's not so over powering. I love your blog and really appreciate you sharing all your awesome ideas! Ashley, you are so creative! That looks awesome! high five. these are great. I love them! I must have some of my own! Thanks for a great, easy-to-follow tutorial! I absolutely LOVE this, I am totally going to do it!!! I wanted to share my take on the wall hangings. The big blocks of solid-colored squares were too much for me, so I combined this with your gathering technique! I love it! And love your blog! looks like I'll be making a new headboard for my bed sometime soon. You have the most amazing ideas! I'd love to link, if you don't mind! I can so relate on the life of a renter. I dream of the day I can actually paint a wall or childproof the cabinets! congrats pretty, ur my new favorite blog. What a fun and creative project. I can imagine myself wildly spinning around in the fabric store trying to pick out the perfect combination. Very inspiring! Where did you get your fabrics for this? It's beautiful! I love your ideas. Love this idea! I was thinking of doing this myself, but you definitely took it to the next level! I will definitely try some of your designs! Kudos! Hi! I thought you should know I featured this project on my craft blog! Thanks for sharing and giving ideas, its always nice! Love this idea! and love your blog!! Thank you for all the fantastic ideas!! I am in LOVE with this idea!! 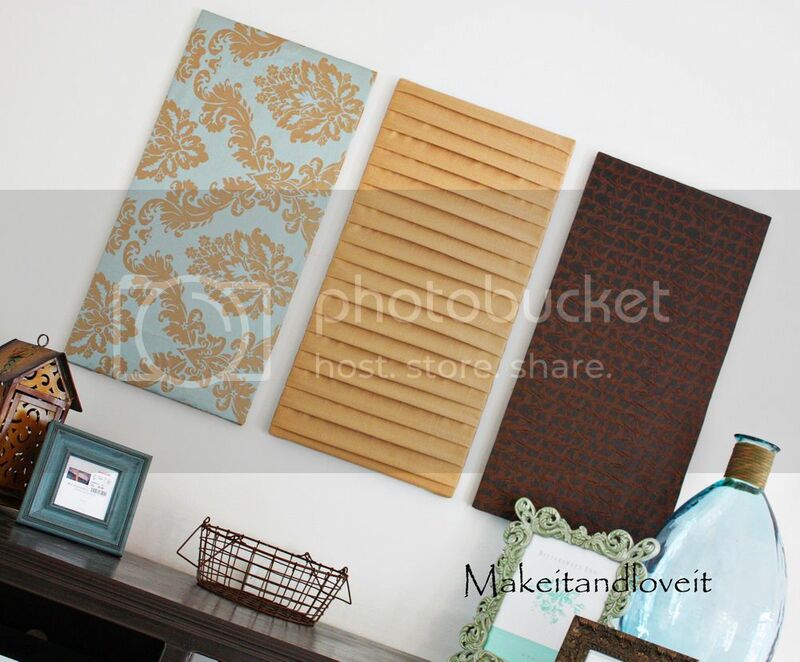 So easy and inexpensive, before I read the tutorial I thought it was fabric on a canvas print! Thank you so much!! we rent , and paint is not allowed , we hang on some fabrics , but your idea is much better! I LOVE this! I’m soooo going to do this in my home!! Curious though, did you use any batting behind the fabric before you attached it to the wood? Nope, no batting. Just the wood. Good luck! Love this idea! Can’t wait to try it myself. I am loving this! You have some great ideas!!!! Love these! I’ve been looking for an alternative to the embellished artist’s canvas for wall decor, something thinner. Who woulda thunk to check the bargain bin at Home Depot ?! 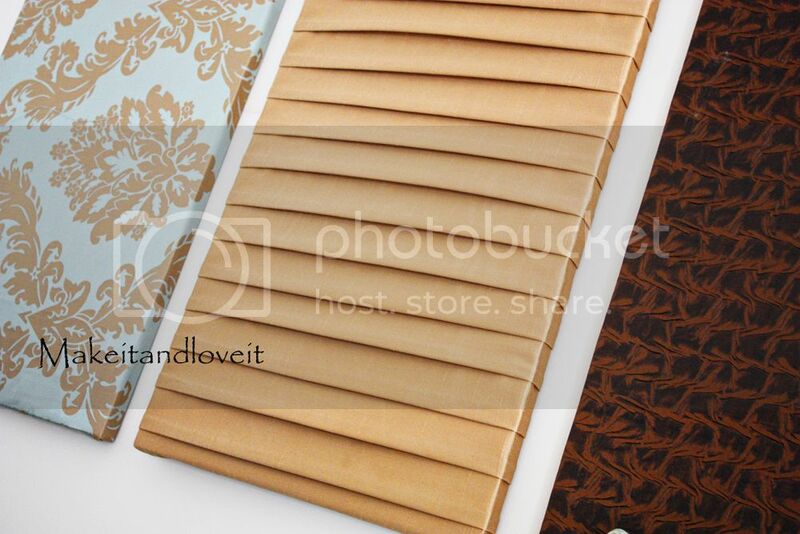 You’re a genius, thanks for the tip, I bet there’s a “Clearance” shelf or bin in their other departments too…drawer and cupboard knobs and handles, wallpaper sample books that are obsolete? My dear hubby won’t understand why I would WANT to run errands to Lowes or Home Depot for him and take forever…hee hee! This could become addicting and I haven’t even started yet. These are supes cute! Had to include them in my round-up of TUCKS sewing projects. Hope to make my own someday!